← Egads! I think I confused many people with my last post. Back to the Ice Dragon. 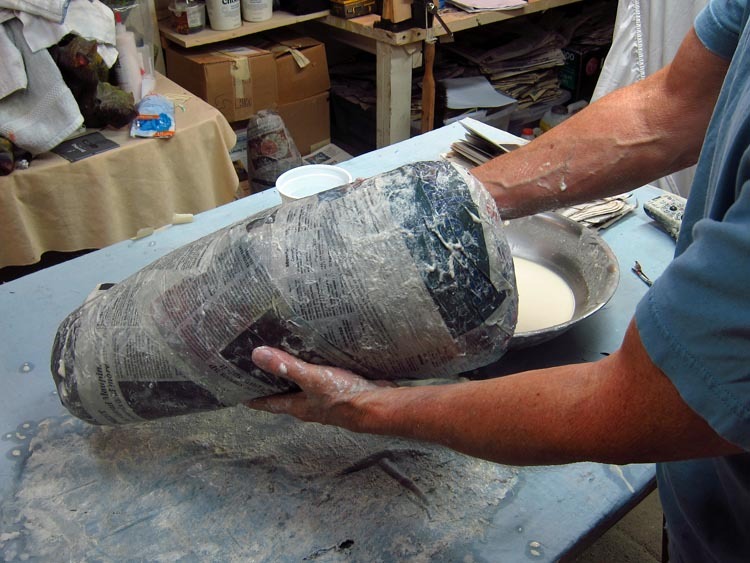 Time to paper mache. I usually do this first. Then while the pieces are drying it I work on teeth, horns, eyes etc.. But as I mentioned earlier I wanted to get some horns I liked before even starting the project. Once again, this isn’t the greatest format for a tutorial. I will just list some steps over a couple posts and hopefully you can match the step with the photos. 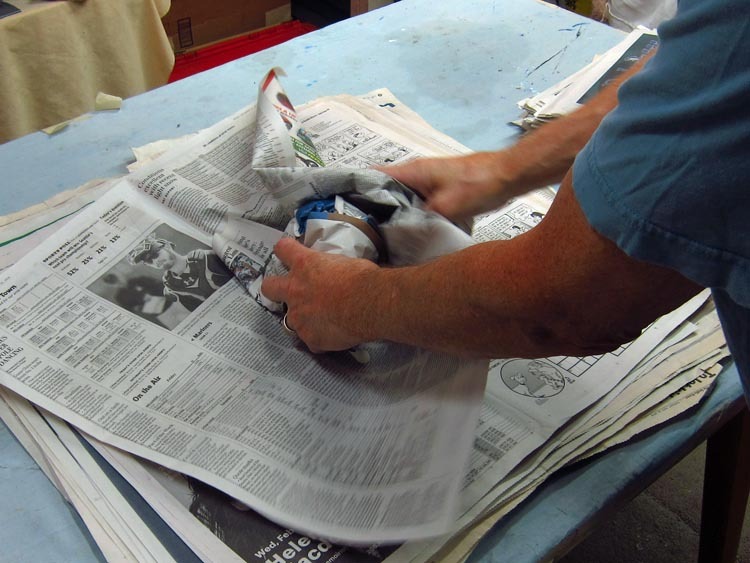 1) I start by unfolding a pile of newspaper. I’ve heard that it’s getting harder to find newspaper. Luckily we still have one paper in my city and I subscribe to it. That subscription gives me way more paper than I need. While other paper will work (like phone book paper) newspaper is still the best. I crumple wads of paper by wrapping one sheet over the next compressing a little more on one end to get the shape I want. When I get the size I need I wrap it with masking tape. This will be the head of the trophy. Here I’m using 1 and 1/2 inch tape, but you can use the 1 inch also. 2) The neck will be too big to make just one wad of paper. So I make several smaller wads and then tape them together. 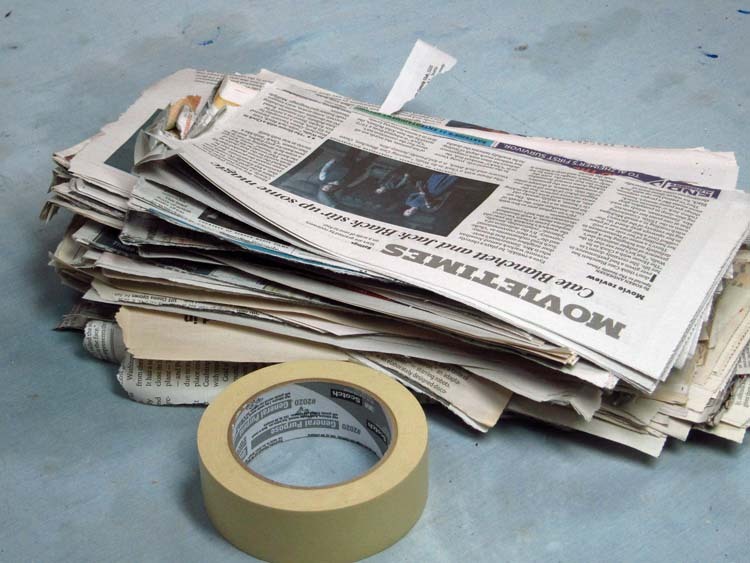 3) Tear up some newspaper into strips. No teeny weenie strips here. I take a section of paper and tear it from the fold downward into two pieces. There is a grain to the paper and it will tear straight. Make one tear in the middle, and another at the edge to get rid of the fold. Then find the middle of the crease at the top and tear there. 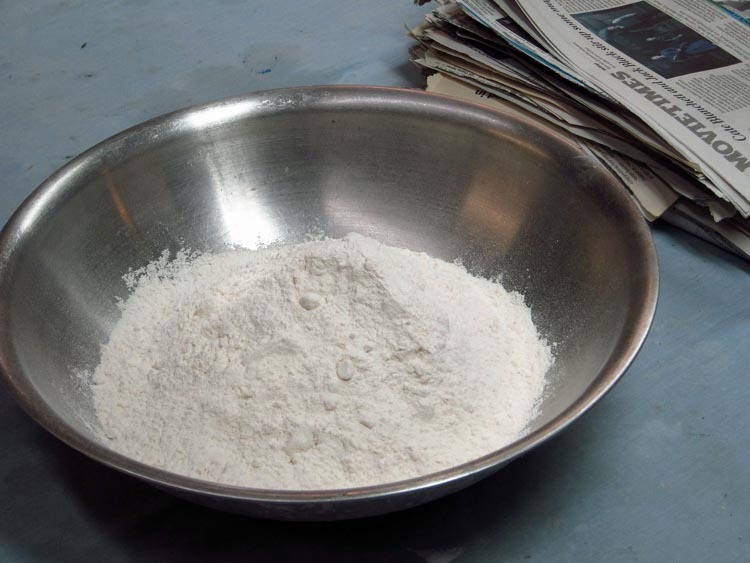 4) I use just cheap white flour, the kind where all the nutrients have been removed, and water. That’s it. 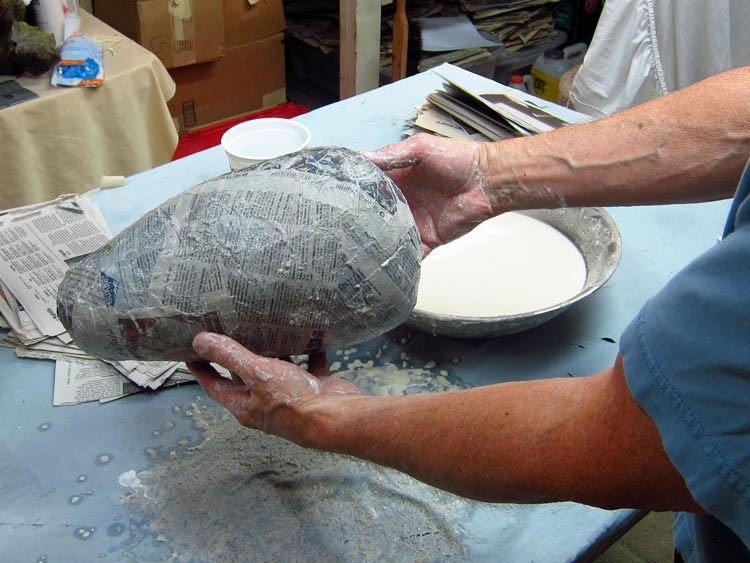 If you look online you will find as many recipes as there are paper mache artists. Some add salt. Some heat the mixture. I just use warm water because it feels nicer. I mix it with my hands until it’s the consistency of soup. I know that is kind of a loose measurement. But there is no perfect ratio. It’s sort of one to one, but it gets thicker as I work, so I add water every so often anyway. You will know the right mix when you get it. It will just work. Btw, you can use white glue instead of flour and water paste if you want (or if you are allergic to flour). I keep a container of water to add as I go because the paste will get thicker as I work. 5) If you learn one thing from me about this process it needs to be this. 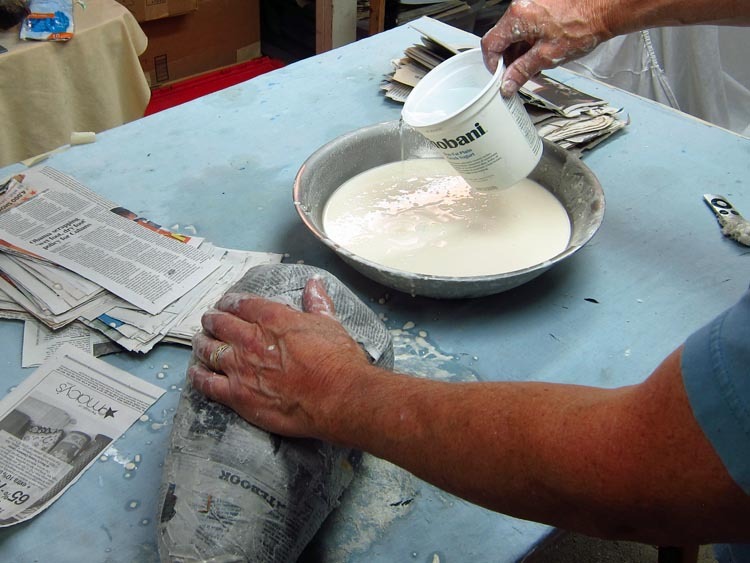 Put ONLY YOUR HANDS into the paste, NOT the paper! Keeping your hands very wet, put one (and only one) sheet of paper on a time. Make sure the paper is completely wet before adding another sheet of paper. 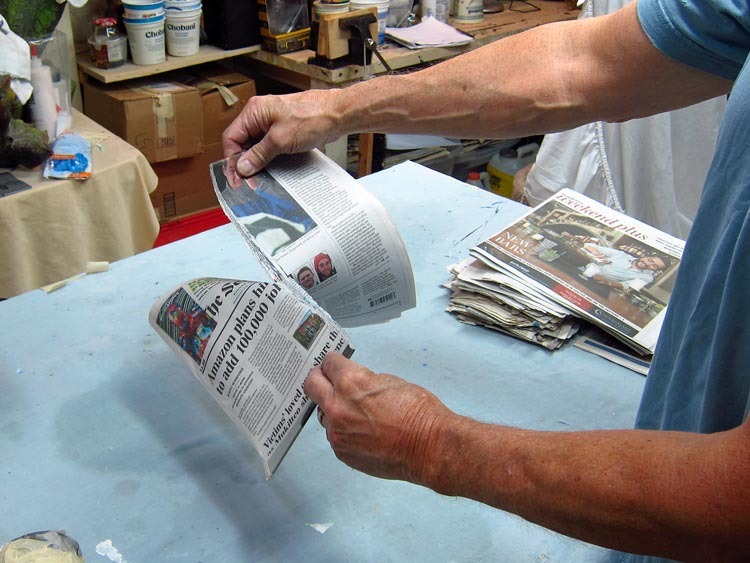 Doing it this way will ensure that you don’t get lumps of paster between layers of paper or air bubbles. When you put paper into the paste it starts to disintegrate and it come apart in the paste. 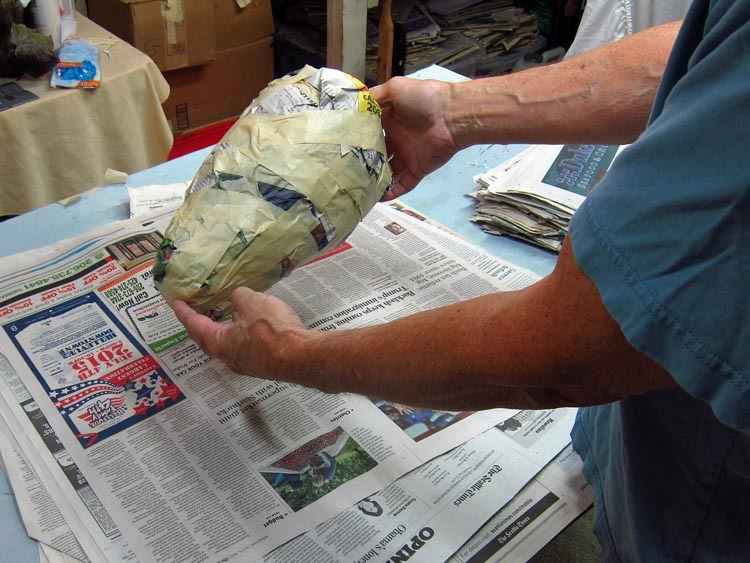 It will also give you clumps of paste between layers insuring that it won’t dry very well. If you do this right, the pieces will be light and very strong. 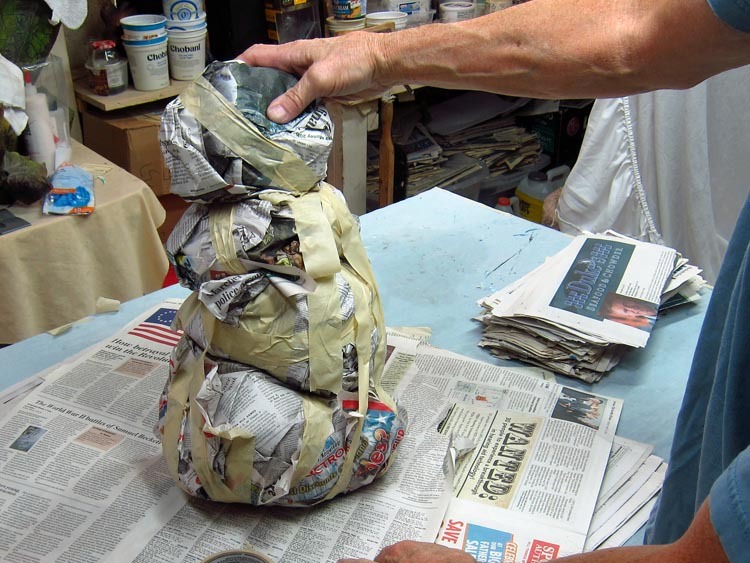 6) Continue until you’ve applied about 5 or 6 layers of paper. Again this is not a hard and fast rule. Make sure it’s at least 3 layers, but don’t make it 10. Put the pieces somewhere warm to dry. Turn them every day or so to expose the wet parts. It can take up to a week for these to dry. Be patient! Do NOT put these in the oven or the microwave or anyplace else stupid. 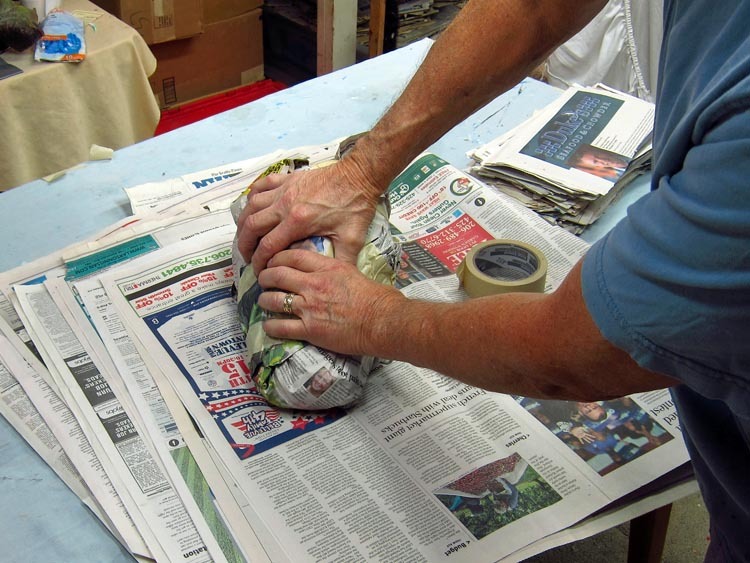 Use the drying time to do other parts of the project. The head and the neck. Remember, patience is a virtue! Okay, for those of you that aren’t patient….and I know who you are, you have written to me many times asking how to speed up the drying. So here is the only way that works. Take a big box, big enough to cover all of the pieces. Cut a rectangular or round hole in the top of the box just big enough to fit the end of your hair dryer. Push the end of the hair dryer into the hole. Turn it on LOW for little while, just enough to warm the air. Prop the box up just enough to let some of the moist air escape. Do this in bursts a few minutes at a time then let the warm air do its job. Every so often turn the pieces to expose the wet areas. Even with this method it will take a couple of days to dry. Find something else to do! Work on the teeth. Eat. Watch “Blade Runner 2049” once again, the best movie of 2017. Do not leave the hair dryer on unattended! More later. 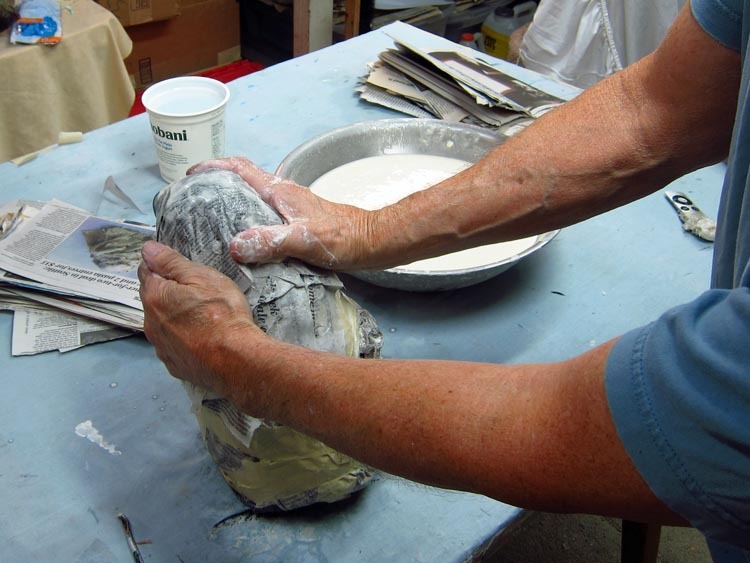 This entry was posted in Paper Mache Ice Dragon and tagged Game of Thrones, paper crafts, paper mache, paper mache instructions, papier mache, papier mache recipes, sculpture. Bookmark the permalink. You are so cool to share all of this knowledge and the techniques of your art! Thank you! You are so cool to take the time to write this comment! Thank you Cindy! Another way to speed up the drying is by using a regular old fan. No heat, just blowing room-temp air over the piece. 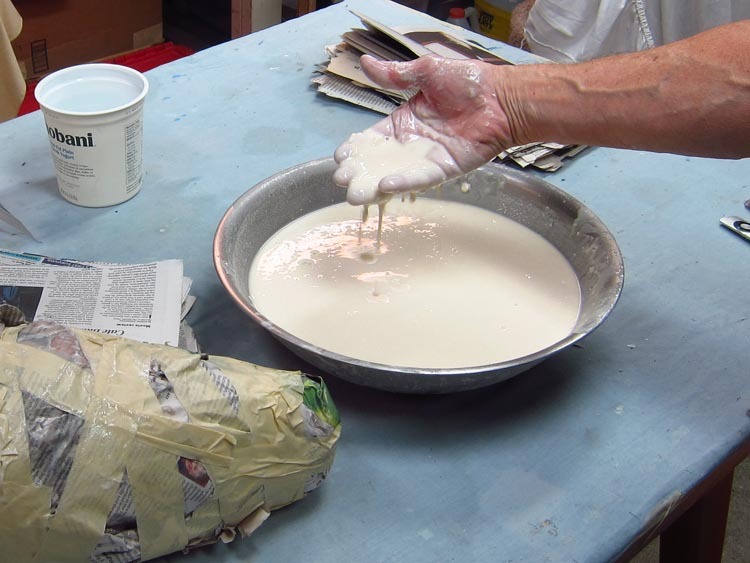 And use white glue instead of flour glue if you have mice or insects like silverfish. They think flour glue is yummy. Yes, and yes. Thanks Sue! Glad to see you working again! 😀 always a pleasure watching you create. Hey Angie. Nice to hear from you! Thanks as always for your support. Hope all is well. Hi, Very nice work! I have a horizontal rod suspended from the ceiling in front of the room air vent. I made hooks from welding rod and stick them into the wet pieces and hang them on the horizontal rod to dry. Works well in summer as the air conditioner is also a dehumidifier. I have to turn the larger pieces the next morning. They seem to dry very quickly this way. Thank you for taking the time to show us your skills. Thanks Steve. That sounds like a great system! Yes, anyplace where air can flow freely works great, particularly in the summer. Good luck with your work! I know you said you use fimo for your teeth and horns on a lot of your projects. What color do you use? Im looking for a natural dinosaur looking teeth and horns color and was wondering if you recommend a certain color of fimo clay? Hello Heather. I use almost every light color of Fimo they make except for white. It is really a judgment call. I think Pearl looks good. Translucent looks good. Florescent looks great and glows in the dark. But the best bone color however is the creme color of a brand called Kato. I don’t remember the name of the color. But there is only white and creme. Good luck!